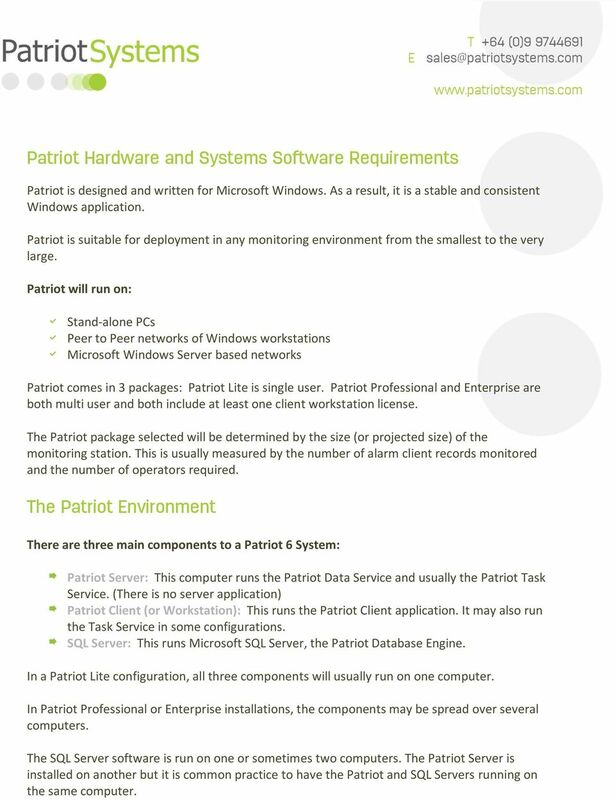 Download "Patriot Hardware and Systems Software Requirements"
1 Patriot Hardware and Systems Software Requirements Patriot is designed and written for Microsoft Windows. As a result, it is a stable and consistent Windows application. Patriot is suitable for deployment in any monitoring environment from the smallest to the very large. 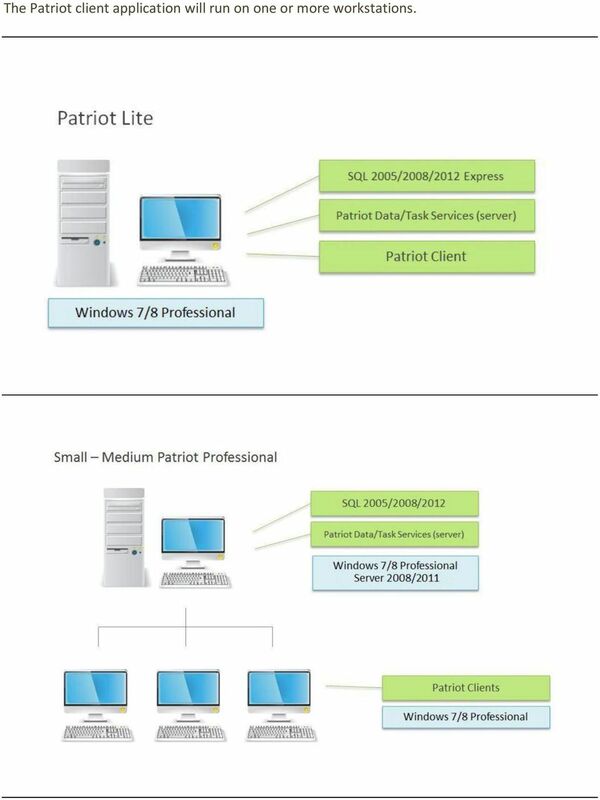 Patriot will run on: Stand-alone PCs Peer to Peer networks of Windows workstations Microsoft Windows Server based networks Patriot comes in 3 packages: Patriot Lite is single user. Patriot Professional and Enterprise are both multi user and both include at least one client workstation license. The Patriot package selected will be determined by the size (or projected size) of the monitoring station. This is usually measured by the number of alarm client records monitored and the number of operators required. The Patriot Environment There are three main components to a Patriot 6 System: Patriot Server: This computer runs the Patriot Data Service and usually the Patriot Task Service. (There is no server application) Patriot Client (or Workstation): This runs the Patriot Client application. It may also run the Task Service in some configurations. SQL Server: This runs Microsoft SQL Server, the Patriot Database Engine. In a Patriot Lite configuration, all three components will usually run on one computer. In Patriot Professional or Enterprise installations, the components may be spread over several computers. The SQL Server software is run on one or sometimes two computers. The Patriot Server is installed on another but it is common practice to have the Patriot and SQL Servers running on the same computer. 2 The Patriot client application will run on one or more workstations. 4 The SQL Server SQL Software Patriot uses industry standard Microsoft SQL Server. This ensures reliable and consistent database performance for the smallest to very largest Patriot systems. Patriot is used with SQL 2005/2008/2012 and Note that Microsoft SQL Server is not included in the Patriot package pricing and should be sourced from a preferred Microsoft supplier. Small monitoring stations can use Microsoft SQL Server Express. Distributed free of charge by Microsoft, it is an ideal package for small monitoring start-ups and can be downloaded from the Patriot web site. SQL Server Express has some performance and database size constraints and is recommended for smaller monitoring stations only. (2000 alarm client records or less.) 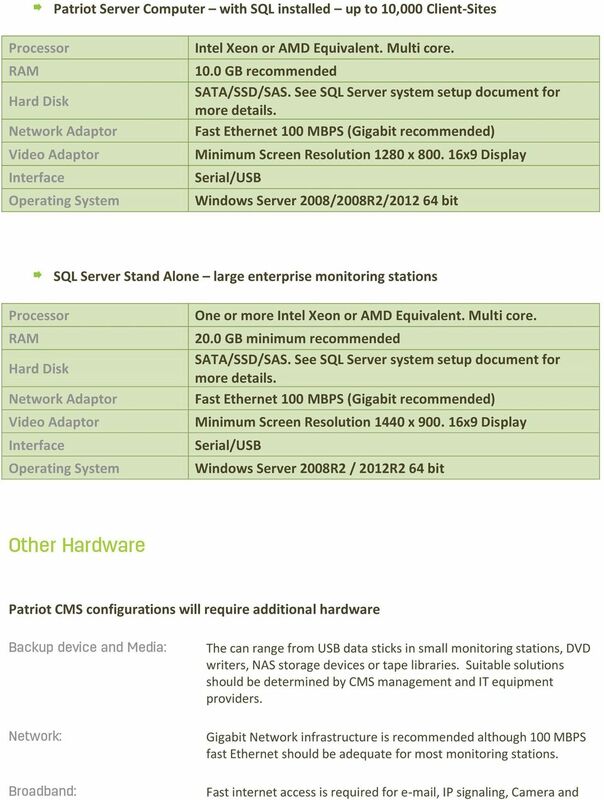 Larger monitoring stations will deploy licensed versions of SQL Server and will also require client access licenses. If Patriot Internet Client Access is to be installed, a License for Microsoft SQL Server may be required. 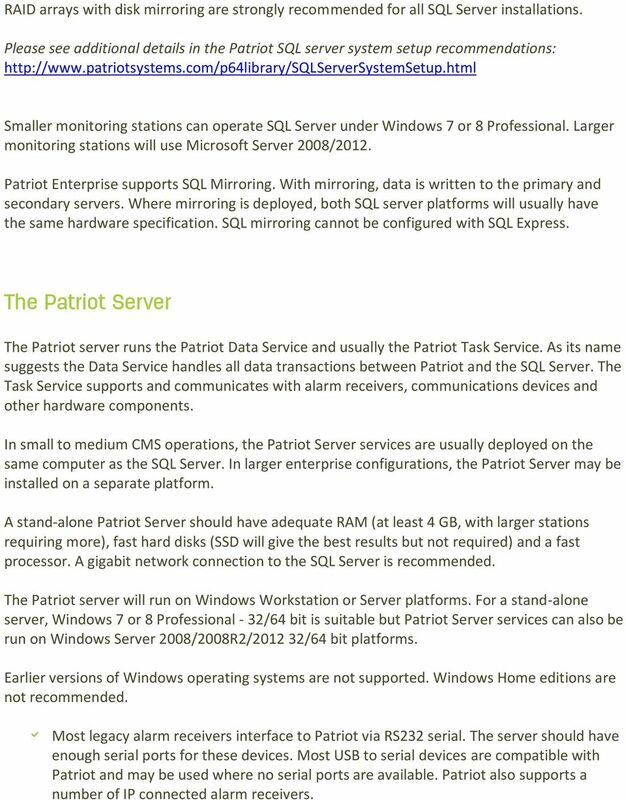 Patriot Enterprise supports mirrored SQL Servers to deliver enhanced data security. Two SQL Server licenses will be required for this configuration. Patriot also supports connecting to a clustered SQL server. 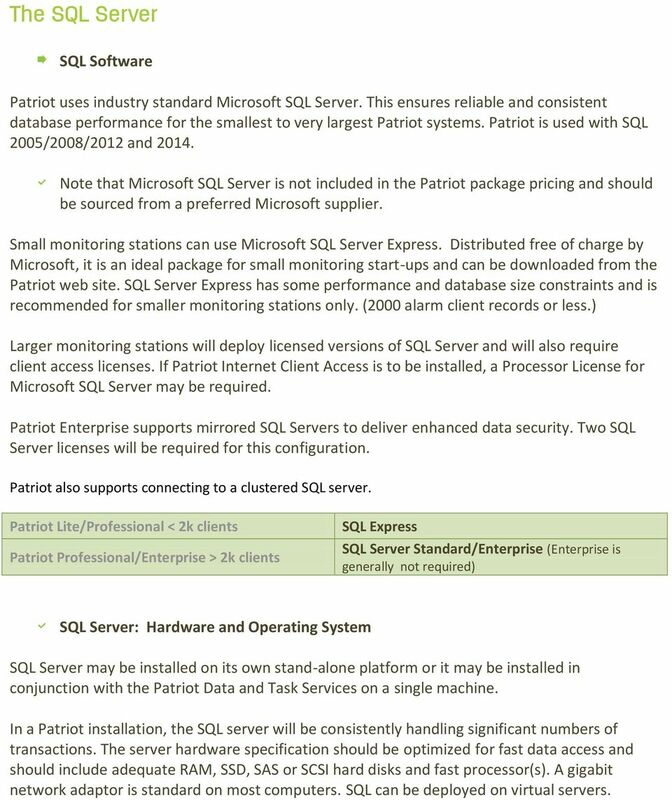 Patriot Lite/Professional < 2k clients Patriot Professional/Enterprise > 2k clients SQL Express SQL Server Standard/Enterprise (Enterprise is generally not required) SQL Server: Hardware and SQL Server may be installed on its own stand-alone platform or it may be installed in conjunction with the Patriot Data and Task Services on a single machine. In a Patriot installation, the SQL server will be consistently handling significant numbers of transactions. The server hardware specification should be optimized for fast data access and should include adequate, SSD, SAS or SCSI hard disks and fast processor(s). A gigabit network adaptor is standard on most computers. SQL can be deployed on virtual servers. 5 RAID arrays with disk mirroring are strongly recommended for all SQL Server installations. 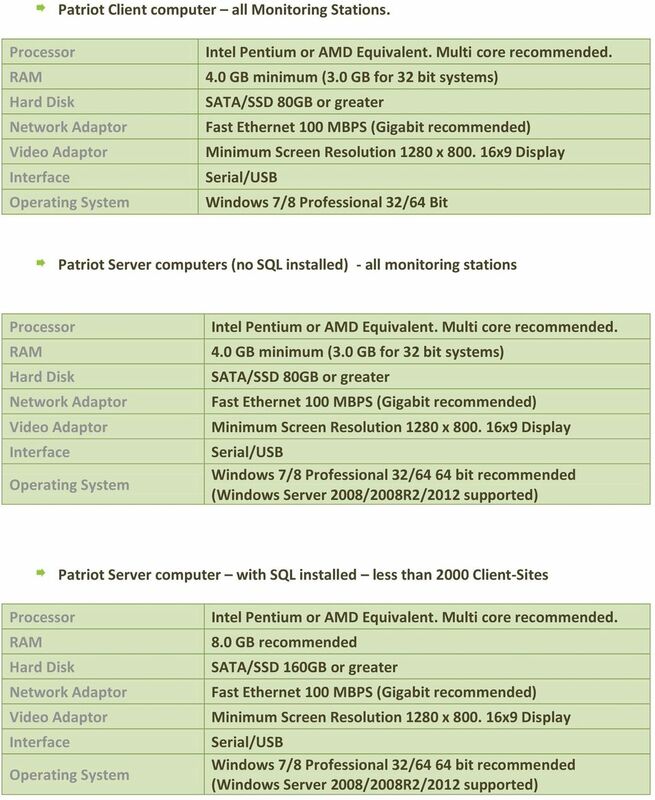 Please see additional details in the Patriot SQL server system setup recommendations: Smaller monitoring stations can operate SQL Server under Windows 7 or 8 Professional. Larger monitoring stations will use Microsoft Server 2008/2012. Patriot Enterprise supports SQL Mirroring. With mirroring, data is written to the primary and secondary servers. Where mirroring is deployed, both SQL server platforms will usually have the same hardware specification. SQL mirroring cannot be configured with SQL Express. The Patriot Server The Patriot server runs the Patriot Data Service and usually the Patriot Task Service. As its name suggests the Data Service handles all data transactions between Patriot and the SQL Server. The Task Service supports and communicates with alarm receivers, communications devices and other hardware components. In small to medium CMS operations, the Patriot Server services are usually deployed on the same computer as the SQL Server. 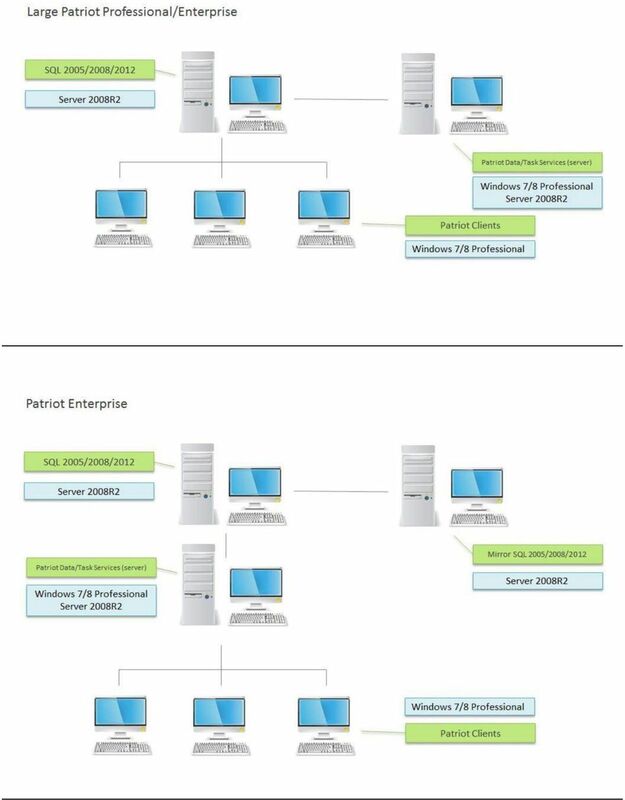 In larger enterprise configurations, the Patriot Server may be installed on a separate platform. A stand-alone Patriot Server should have adequate (at least 4 GB, with larger stations requiring more), fast hard disks (SSD will give the best results but not required) and a fast processor. A gigabit network connection to the SQL Server is recommended. The Patriot server will run on Windows Workstation or Server platforms. For a stand-alone server, Windows 7 or 8 Professional - 32/64 bit is suitable but Patriot Server services can also be run on Windows Server 2008/2008R2/ /64 bit platforms. Earlier versions of Windows operating systems are not supported. Windows Home editions are not recommended. Most legacy alarm receivers interface to Patriot via RS232 serial. The server should have enough serial ports for these devices. Most USB to serial devices are compatible with Patriot and may be used where no serial ports are available. Patriot also supports a number of IP connected alarm receivers. 6 The Patriot 6 Client The Patriot 6 client provides the user interface for alarm processing and database management. Patriot 6 client software may be deployed to workstation or server platforms but is usually installed to computers running Windows 7 or 8 Professional. The workstations are networked back to the Patriot server. Additional Patriot client workstation licenses may be purchased and added as required. Patriot client workstations should have adequate (4.0GB minimum) and fast processors. SATA hard disks are suitable for client machines. Minimum Screen Resolution Patriot Lite/Professional: 1280x 800 min Patriot Enterprise: 1440x900 min Note: These resolutions assume a standard DPI setting. If you are using a custom DPI setting or magnifying the screen text and items, then you will need to use a higher resolution. For example using a 125% magnifier setting, requires a screen resolution of 1600x1200 for Professional, and 1920x1080 for Enterprise. Reports Workstation In larger monitoring stations the provision of a client workstation dedicated to reporting is recommended. This reduces the load on the server, particularly when large numbers of automated reports are generated. 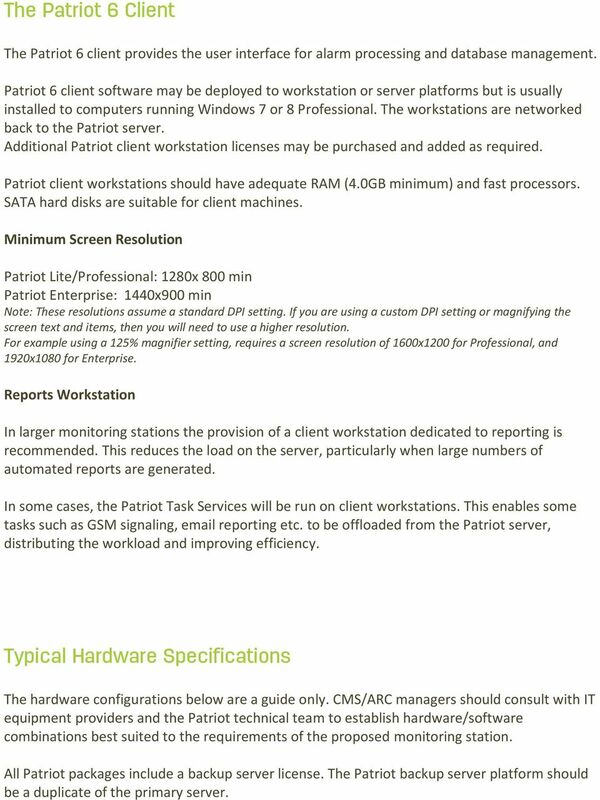 In some cases, the Patriot Task Services will be run on client workstations. This enables some tasks such as GSM signaling, reporting etc. to be offloaded from the Patriot server, distributing the workload and improving efficiency. Typical Hardware Specifications The hardware configurations below are a guide only. CMS/ARC managers should consult with IT equipment providers and the Patriot technical team to establish hardware/software combinations best suited to the requirements of the proposed monitoring station. All Patriot packages include a backup server license. The Patriot backup server platform should be a duplicate of the primary server. 9 other IP devices. Patriot support is usually delivered via fast internet connection. A secure router firewall should be provided. Alarm receivers, GSM senders and other signaling hardware are components of most monitoring stations. Other Software Anti-virus software is strongly recommended. Antivirus packages which have minimal impact on server and workstation performance should be selected. Backup Automation software may be required to automate off site backups to selected media. V2.7.x Installation on a Database Server Note: This document is to be used on a new database server installation. When EP terminates the use of Hosting CC OG, EP is required to erase the content of CC OG application at its own cost. V2.8.x Installation on a Database Server Note: This document is to be used on a new database server installation. Software and Hardware Requirements Version: 5 Last Changed: 17/07/2012 Arena Group Limited, a a company registered registered in England in England Wales, and Wales, registered registered no. 02168309. VMWare Workstation 11 Installation MICROSOFT WINDOWS SERVER 2008 R2 STANDARD ENTERPRISE ED. Server must be connected to the internet via high-speed internet connection. Backup and Recovery. Introduction. Benefits. Best-in-class offering. Easy-to-use Backup and Recovery solution.